Angela's Garden and Cabin Rentals feature authentic log cabin rentals set on a private mountain-side. The professionally decorated log cabins encourage you to recharge and reconnect with friends and family in person. Our private retreat is in the beautiful mountains of the Blue Ridge Parkway, less than an hour north of Asheville in Green Mountain, NC., and 45 minutes from the Tri-Cities Airport in Johnson City, Tennessee. Angela's Log Cabin Rentals are 6 miles north of Burnsville, near the Black Mountain Range and Mount Mitchell. Angela's Log Cabins sit at an elevation of 4000'+ on Ayers Mountain. Angela's Garden and Cabin Rentals showcases two authentic log cabins that are far enough away from town so you can completely relax, yet with neighbors close enough so that you don't feel isolated. This is THE PLACE to recharge yourself . Disconnect from your electronics and reconnect with nature, your family and your friends. Interact with the people in your life in real time. Need to check your email? Not a problem; just head into town to one of the cafes offering free WiFi. Meet the locals, real people and stay connected on your terms. There is cellular service at the cabins but signals can be dropped frequently and depending on your carrier and equipment, cellular service can be spotty. A welcome sight! Our genuine log cabin ready for you at Angela's Garden and Cabin Rentals. Angela's Garden and Cabin Rentals shares it's physical site with the Green Mountain Deer Rescue. A deer rescue founded and run by Angela and Keith. 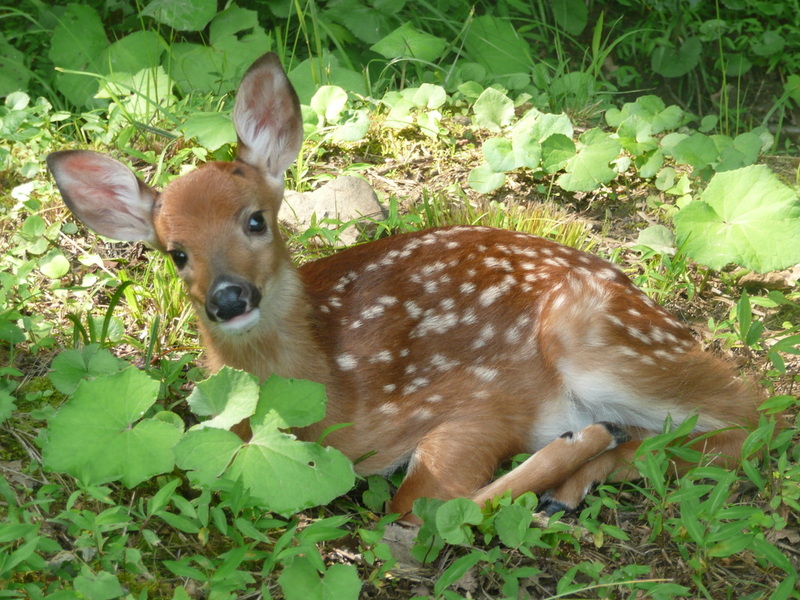 When you hike the trails surrounding the cabins, you may just run into some of the deer that were saved and now call Green Mountain home. Authentic log cabins near the Blue Ridge Parkway with in-cabin meals available. Click on the letter to the left to Contact Angela's Log Cabin Rentals or call us between EST 8 am - 8:30 pm at 828-682-4311. If we're out feeding the deer, please call again. We appreciate your business and look forward to meeting you. 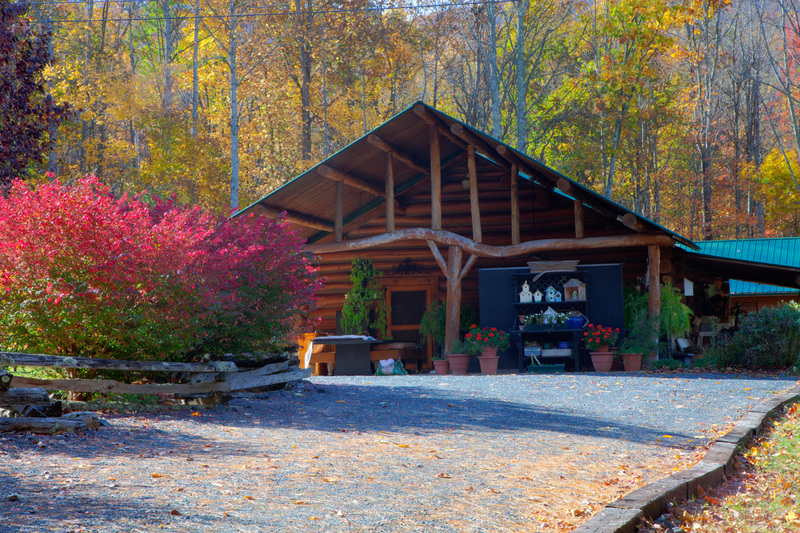 Angela's Garden and Cabin Rentals is located amid the Blue Ridge Mountains of Western North Carolina just one hour from Asheville, 45 minutes from Johnson city and six miles north of Burnsville in Green Mountain. Angela's Log Cabin Rentals are available in the spring and summer. Fall and winter dates have very limited availability.